George Gearing is a whiz with mechanics, which isn’t surprising, since his uncle runs a scrapyard. George has a ton of friends—but unfortunately they are all either robotic or over 65. But when his best bot, Jackbot, gets an unexpected upgrade, things start to change. Jackbot’s amazing new abilities catch the eye of Dr. Micron, head of robotics at TinkerTech, and suddenly George thinks that his future isn’t so bleak after all. 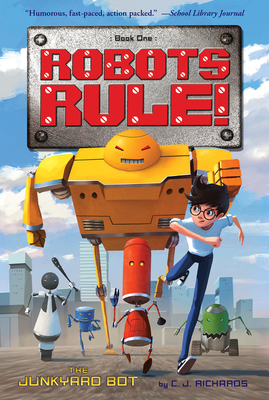 Then Jackbot is kidnapped, and all the robots in town start losing control. Suddenly it’s up to George and his new friend Anne to test their mettle and save the day. "Young robot enthusiasts will surely be amused." "A humorous, fast-paced, action-packed science fiction novel." "Clever, whimsical, and fast-paced, this adventure never loses its sense of fun." "Amusing names...loads of action, and comical observations combine with Fujita's anime-inspired illustrations to offer a spirited beginning to a fun series." "The snappy pace and straightforward storytelling give this accessibility to a younger crowd, while Fujita's occasional digital artwork complements the story's techy underpinnings and adds a bit of visual interest. Aspiring mechanics will be inspired by what Jackbot and his cohorts can do."